Guys in Labor. Yep, you read that right. Last Wednesday I got sick. Real sick. And I’ve been sick since then. Great, huh? I’m not sure what gets me more annoyed, the fact that I was too tired to even walk to the kitchen and make something to eat and, therefore, didn’t leave the house for days, or that I didn’t have energy to even read. But anyway, right now I’m medicated and on my way to complete recover. I’m crossing my fingers, at least. However, I’m a little confused about the medicine the doctor gave me, since it’s supposed to lower my immune system (the one I thought I needed to fight this thing) and tells me to avoid sick people (wait a minute, am I not sick? should I avoid myself?). But I’ll give it a try. I have to. Anyway, ever since I got sick not many things got me happy. Yesterday I did laugh a whole lot watching Diane Keaton’s interview on The Ellen DeGeneres show. But then today my friend Mel posted this video on her Facebook and I just had to share it here. It’s about two Dutch TV hosts (Dennis Storm and Valerio Zeno) who decided to be hooked up to a contraction machine to simulate labor pain. Because who doesn’t want to experience that, right? In fact, it is a type of experience very hard to describe, unless you’ve been through it. The best way I saw it described was that someone was twisting her insides and trying to rip them out of her body. But those two brave nut-jobs decided to go and see what the fuss was all about. A new tattoo. Because who doesn’t need more tattoos? I had to get a new tattoo. I just had to. Okay, maybe I didn’t necessarily need a new tattoo, but when you have a tattoo artist as a friend it’s kind of hard not to. Especially if he’s pretty awesome at what he does. Yes, he’s my friend. No, I don’t think he’s awesome just based on that. I’ve seen lots of his works and have already 3 tattoos designed by him. Most of all, I respect him as an artist. 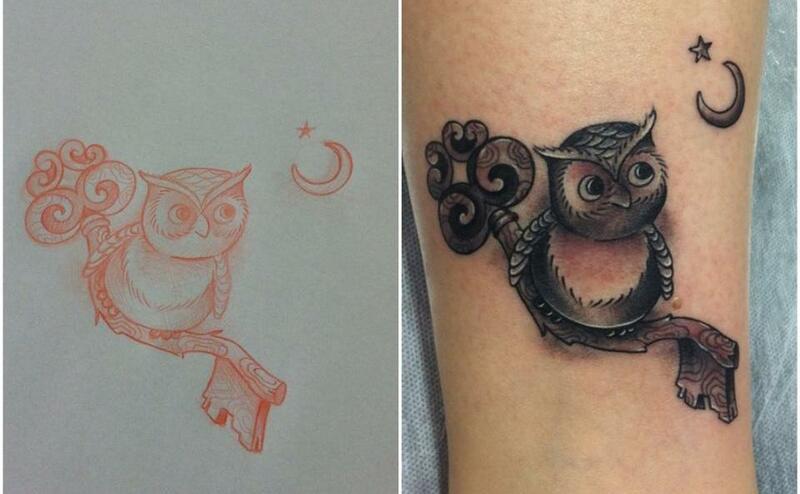 So I came to him with an idea and he created the design for a tattoo that only I have. Well, until someone finds it on the internet and copies the idea, that is. But at least I was the first one to have it. And hopefully they will ask their tattoo artist to add their own twist to it and it will be different. Anyway, it’s a very simple tattoo, but it amazed me to watch Mauricio doing all the fine details in it. Doing the lines, the shading, the lighting, and all the tiny things in it. Pretty awesome. It was my first time being able to watch the tattoo being made, and I loved it! My opinion: if you get a tattoo, ask the tattoo artist to make you something original, something that is you. I usually go to him with some examples of tattoos I like and throw my ideas at him. He then shows me his drawings for the tattoo and we discuss any (if necessary) adjustments. P.S. : If you use the picture anywhere please include the tattoo artist’s name. Thank you. Give a little love and respect. Just because. Today I saw two videos that made me think about certain things. They made me think about how we sometimes forget to be good for no reason. Why not help someone without being asked to? Why not be kind just for the fun of it? I learned that you’re kind to others not because it’s expected of you, not because you’ll be punished or because you won’t be rewarded, but just because. I learned that you’re kind to others. Period. If they are nice to you in return or not, that’s another thing, but you should still be nice to them. You respect them just because. You respect others because you do. If you need more reasons, think about this: treat others as you’d like to be treated. If you don’t like it done to you, don’t do it to others. It’s as simple as that. And let’s not forget how much our actions influence others. There’s always someone watching us. Our actions impact not only the ones we’re nice to, but others around us as well. To me there’s nothing more rewarding than when I see a child in my care treating others the way I treat them, helping them, asking if they are okay, or asking if they can help. That’s the best reward, in my opinion. Be kind. Be respectful. Just because.